Residents of Peace River are well aware of the potential threat posed by Pat’s Creek culvert after floods caused by infrastructure failures in 2013 and 2014 led to a waterlogged downtown. While the Town strives to prevent these kinds of situations from happening, the costs associated with repairing the aging culvert is simply more than the municipality can bear on it’s own. In 2015 phase one of the Pat’s Creek culvert rehabilitation took place, funded largely by the Alberta Community Resilience Program (ACRP). The $2.55 million project focused primarily on rehabilitating the deteriorating floor of the culvert. The funding announced by the province on Feb. 29, 2016 will allow the Town to move ahead with the second phase of this project, estimated at costing $2.3 million in total. Phase two will included the installation of back flow preventer valves to help manage water levels when the Peace River rises. Phase two is an important stage that involves the installation of backflow preventer valves. These valves will let water flow out of Pat’s Creek into the Peace River but will keep the river from flowing back into the culvert. In February of 2016 Premier Rachel Notley and Peace-River MLA and deputy speaker, Debbie Jabbour were in Peace River to announce a $2.07 million grant from the Alberta Community Resilience Program (ACRP) to help fund phase two of the Pat’s Creek culvert improvement project. Phase two is an important stage that involves the installation of backflow preventer valves. These valves will let water flow out of Pat’s Creek into the Peace River but will keep the river from flowing back into the culvert. Although the valves are not unique technology, their application in this culvert is. This image taken by the Peace River Fire Department shows the devastation in downtown Peace River after the 2014 flood. 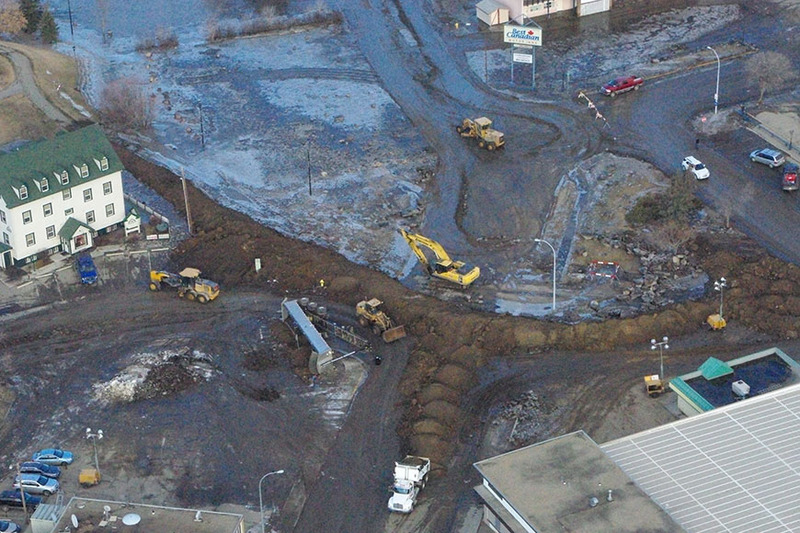 In the last three years three floods have occurred due to culvert failures; April and June, 2013 and April of 2014. Phase One was budgeted at $2.55 million (That was the phase one ACRP ask), we were granted $2.295 million.